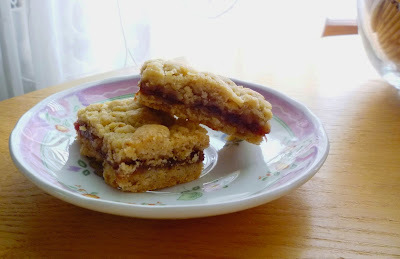 The recipe for jam bars I'm sharing today has been a part of my baking repertoire for several years. Until recently I had never planned on posting it... 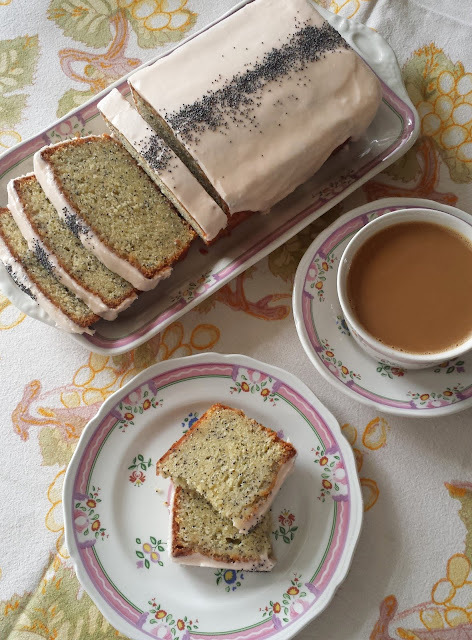 The recipe is virtually unchanged from Martha Stewart's recipe (which is available on line). 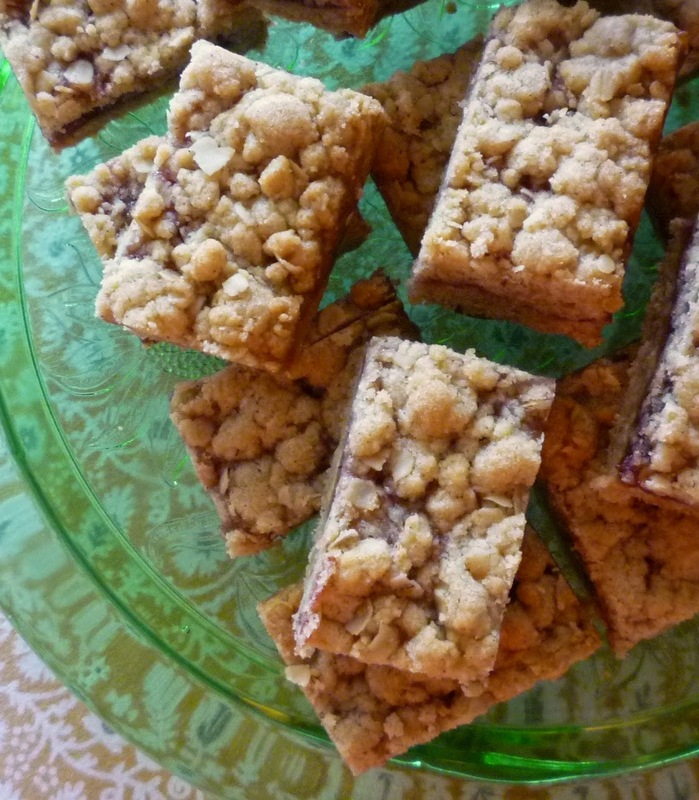 Furthermore, it isn't too different from the slightly more upscale Mixed Berry Crumble Bar that I posted here a few years ago. But I have made these bars four times in the past month (for personal/family consumption) and they are so quick & easy....so tasty & friendly...I thought others might want to have this recipe in their repertoire too. 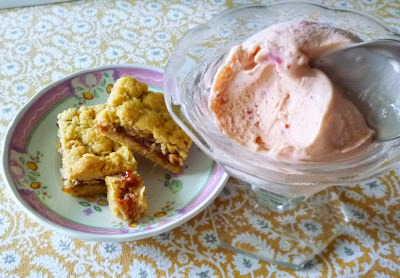 The batch of bars I made yesterday was strawberry. I spent a wonderful hour last week in a strawberry patch, picking a huge flat of berries. We have enjoyed many of them plain, for breakfast...or with sugar, over vanilla ice cream. And I did make a big batch of fresh strawberry ice cream. But most of these berries were destined for jam. As is always the case when I make a batch of preserves, there is extra...not enough to fill a jar...but more than just a spoonful... So yesterday this extra went into these bars. You can of course use a good quality store-bought preserve when you make the bars, but they make an awfully nice home for any preserves that might come out of your own kitchen. Besides strawberry, blueberry and plum are my favorite. But since we are at the beginning of the summer fruit...and jam making...season, the possibilities seem endless. Today really is the perfect moment to share this recipe. For most Americans, today is the traditional, unofficial start of summer.... the season of all manner of outdoor activities.... picnics, backyard barbecues, concerts in the park, hikes, trips to the beach or pool, boat rides, etc. I think that most (if not all) of these activities require some sort of sustenance that comes in a packable/transportable form. So whether you are in need of a sweet treat for the end of an official meal...or just a little something to take along for a pick-me-up nibble in the midst of your activities...these bars will fill the bill quite nicely. Happy summer. Butter an 8-inch square baking dish. Line with parchment and butter the parchment; set aside. In a small bowl, whisk together flour, cinnamon, salt, and baking powder; set aside. In a medium bowl, cream butter and sugars until well blended. Beat in the egg yolk and the vanilla. Add the flour mixture and mix until just beginning to be absorbed. Add the oats and continue to mix until all the dry ingredients have been absorbed and the mixture looks clumpy. Place half of dough (265 g.) into the prepared pan and press into an even layer. Spread the jam over dough, leaving a 1/4-inch border so the jam doesn't stick to the sides of the pan. Sprinkle remaining clumps of dough over all. Lightly press to form the top layer. Bake in a preheated 350° oven until the top is golden, 25 to 30 minutes; cool completely in the pan. Turn the cake of bars out of the pan and flip back over onto a cutting board. Cut into 16 to 24 bars with a serrated knife. The original recipe called for sliced almonds instead of oats. To make them this way, omit the oats and replace them with 3/4 c. sliced almonds. If you like, substitute 1/4 t. almond extract for the vanilla. Any favorite fruit jam will work in this recipe. I prefer dark jams like strawberry, cherry, blueberry and plum....but I'm sure a lighter jam (like apricot or peach) would be delicious too—especially in the almond version. 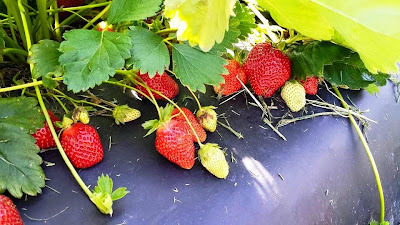 Note: If you are looking for a homemade Strawberry jam recipe, David Lebovitz just posted one that is quite similar to the one that I make. I use more sugar...75% of the net weight of the berries....and I crush the berries with a potato masher before adding the sugar.